Description: White 3-step camper that fits on top of the above mentioned truck. 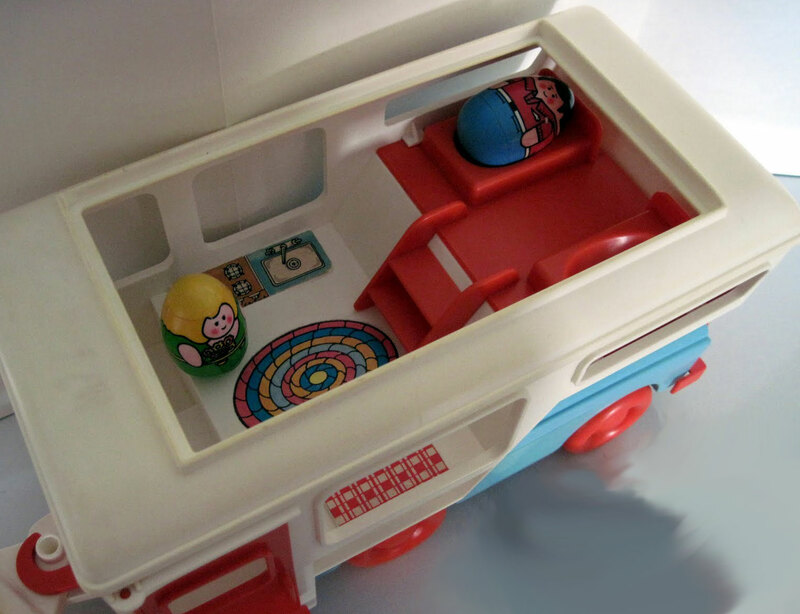 Both sides of the camper have a small litho marked "Weebles" in red and "camp-about" in blue. One side has a Romper Room litho, and the other side has a red door and a red "step" under the door. 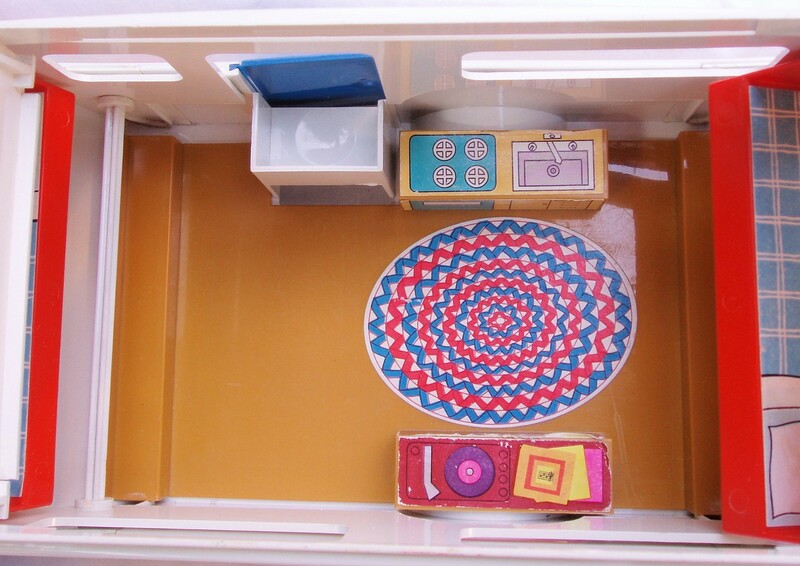 The top of the camper has a large rectangular opening to allow play inside. Inside features 2 red molded beds, a red 2-step ladder, oval rug litho, stove and sink litho, and red/white checkered tabletop litho. Other: Camper Requires: 2 each - HTW142 - Red hollow plastic support tubes (fit under beds to keep camper upright when removed from the truck). Large white camper with a white triangular hitch on the front (to attach to the HTW100 car), and a white motorcycle rack on the back. One side of the camper has a blue door and a red "step" under the door. 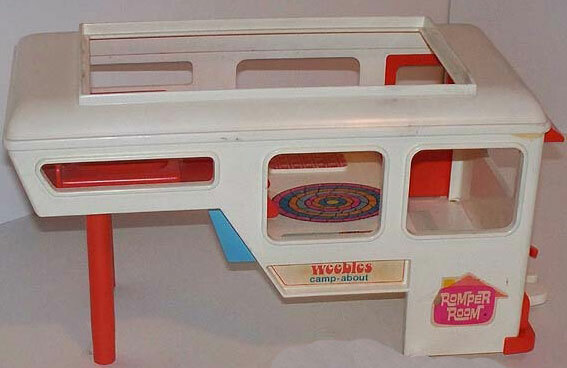 The top half of the camper can be raised, and kept upright via the red swing-out window/bed on each end of the camper. The top edge of the camper has a pull-out canopy with a scolloped edge. Marked, "©1972 Hasbro®, MADE IN U.S.A.". Camper Side 1 - Extra wide yellow (light orange) litho with a Romper Room litho on one side and "weebles" in white on the other end. Has a half-circle wheel hump in bottom middle. Litho fits on left exterior side of the camper. Camper Side 2 (wide) - Wide yellow (light orange) litho with "weebles" in white. Has a half-circle wheel hump in bottom. Litho fits on right rear exterior side of the camper. Camper Side 2 (narrow) - Narrow yellow (light orange) litho with a Romper Room litho. Litho fits on right front exterior side of the camper (by camper door). 2 each - Window bed - Rectangular litho of a blue bedspread with white lines forming squares), light blue sheets, and a white pillow. Litho fits on red swing-out window/beds. Rug - White oval rug with rows of blue zig-zags and rows of red zig-zags. Record Player - Red rectangular litho with a record on a record player and 3 record sleeves. Litho fits on top of inside hump that covers the wheel. TV - Red rectangular litho with a TV screen. Litho fits on the side of the inside hump that covers the wheel. Stove & Sink - Yellow rectangular litho with a square blue stovetop with 4 white burners and a square grey and white sink. Litho fits on top of inside hump that covers the wheel. Oven and Cabinets - Yellow rectangular litho with a square blue oven face on one side, and a cabinet and 3 drawers on the other side. Litho fits on the side of the inside hump that covers the wheel. Other: Marked, "©1972 Hasbro®, MADE IN U.S.A.".